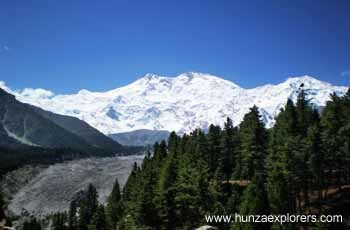 Nanga Parbat (literally, Naked Mountain) is the ninth highest mountain in the world. It is the western anchor of the Himalayas around which the Indus River skirts before it debouches into the plains of Pakistan. It is located in the Diamir district of Gilgit-Baltistan province of Pakistan. 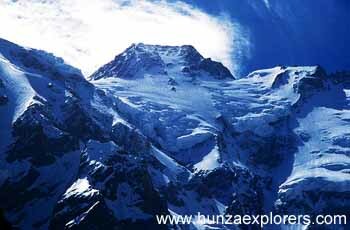 Nanga Parbat is one of the eight-thousander, with a summit elevation of 8,126 metres (26,660 ft). 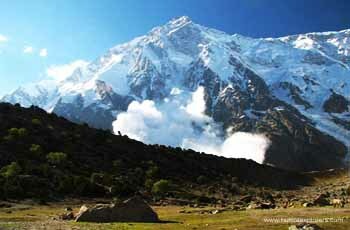 An immense, dramatic peak rising far above its surrounding terrain, Nanga Parbat is also a notoriously difficult climb. Numerous mountaineering deaths in the mid and early 20th century lent it the nickname “Killer Mountain”. Along with K2, it has never been climbed in winter. Nanga Parbat has three faces, Raikot, Diamir and Rupal face.